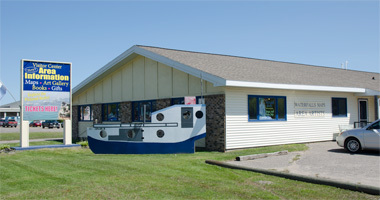 Click to find an ATM!Munising offers a variety of shops to help you find what you’re looking for. Putvin Drug Store offers a wide selection of unique gift ideas, collectables, greeting cards, wrapping supplies and housewares. Whether you are looking for a holiday item, a unique gift and card to give, or just want to browse and treat yourself with something special, Putvin Drug Store has it all… and much, much more. The Gift Station features a full line of unique gift items and souvenirs to fulfill all of your vacation shopping. We have the largest selection of t-shirts and sweatshirts featuring Munising, the Pictured Rocks, the Upper Peninsula, Lake Superior, and more. Here you’ll find a large selection of sundresses, tote bags, beach towels, moccasins, water shoes and other essentials for your summer pleasure. We also have several jewelry lines featuring fashion and northern themed items. For fun, we’ve got candy featuring Lake Superior beach rocks, chocolate “Moose Poop” and “Trout Eggs.” You’ll also find postcards, local books, Yooper souvenirs, games and toys to satisfy your every need. The Gift Station is an absolute must see while visiting the Munising area. Located in downtown Grand Marais, Superior Hardware has a bit of everything. From general hardware and paint mixing, to tools and a fully-stocked and expansive lumberyard. They also carry camping supplies, housewares and hunting/fishing gear. Superior Hardware is also a great stop for travelers who may have forgotten something at home because this store has just about everything. Their friendly staff can really help you out of a bind and get you back to a relaxing vacation. So, visit Superior Hardware in Grand Marais because they’re the hardware store with so much more! Thomas Baugnet & Jill Zwemer Baugnet, artist/owners, create a full line of pottery for the home; a synergy of fine craftsmanship, ergonomics & beauty. Together with over 50 other local and regional artisans, you will discover a memorable collection of fine art and craft, in a wide variety of mediums. Open May through December. Daily, mid-June through mid-October: Mon-Sat 10am-7pm, Sun 11am-5pm. Hours vary the remainder of the year. UP~Scale Art is a retail art gallery featuring the works of artists from around the Great Lakes Area. Browse the gallery’s many offerings including photography, watercolor, oil, hand blown and stained glass, fiber art, jewelry, pottery, wood, and metal sculpture. UP~Scale Art is a cooperatively run arts center managed by the Munising Bay Arts Association, LLC. The center also hosts workshops and classes. Down Wind Sports is an Upper Peninsula owned and operated business, with stores located in Munising, Marquette and Houghton. We specialize in mt. biking, hiking, fly fishing, camping, kayaking, climbing, cross country skiing, alpine skiing, and snowshoeing. We also host a variety of events throughout the year including the popular Michigan Ice Fest held in Munising. Fireflies Gifts, Confectionery & Coffee (formally Chasing Fireflies) offers a variety of great products already loved by so many (including Grand Island Fudge & Truffles!) New items: Lake Superior Woolen Blankets, Essential Oils, Diffusers, and MORE!!! We have gifts and treats for all ages and occasions. Grand Opening in 2018! We invite you to experience our commitment to excellent customer satisfaction and a wide variety of high quality products at great values. We offer the freshest produce, meats and a variety of bakery items. Bob’s IGA… where we specialize in personalized IGA service and convenience. Folks around Munising shop IGA for our superior cuts of beef, fish and poultry.